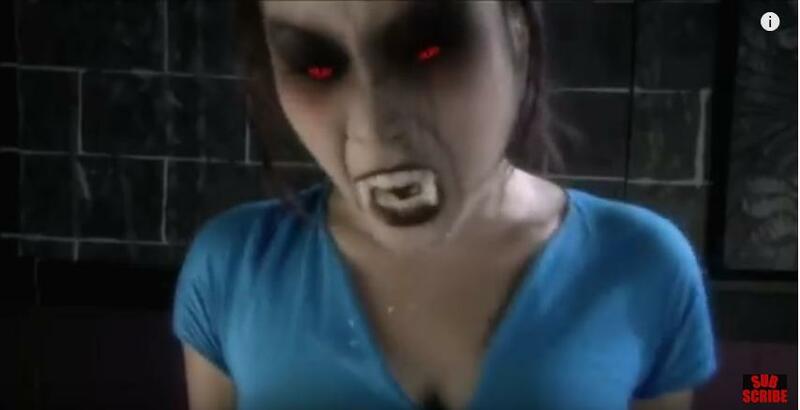 Vampire Beauties: Vampiress Review: "Dracula Cinta"
The Gist: The spirit of Dracula is possessing everyday people and feeding on women wearing red. Clarification: A modern Hammer style Dracula film out of Indonesia. A group sneaks into a museum after hours where Dracula's fangs are being displayed. They pour blood on the fangs which results in the spirit of Dracula awakening and possessing one of them. Since he doesn't have a physical form Dracula goes from body to body allowing him to have access to specifically women wearing red which was the color his love was wearing when he was murdered by hunters. Selling Point: It's a great concept for a vampire film. Way easier to understand than Graveyard Shift The Understudy and that film was actually in a language I was native in. Female Vampire Factor: Eventually you do have victims returning as vampires. The Second victim bitten by her boyfriend is the first to turn. She has mixed results as a vampire. Taking a group of unsuspecting guys down but allowing what seemed by be a transsexual prostitute to get away. The First victim wakes up in a morgue where she takes out two people including the coroner (who was really enjoying looking at her naked body). Then there are plenty of generic female vamps in the films final martial arts brawls. But in the answer to the question of does she or doesn't she for the hot main character? The answer is no (damn Dracula and his procrastination). She gets saved just in time. That doesn't change the fact that this is a great roster so I give it a Vampire Beauty Rating of 5 out of 5.